Record-breaking conditions and breakneck speeds were heating up a high-seas game of pursuit on Thursday as CAMPER pushed hard against Leg 1 leaders Telefónica, while Groupama faced yet another fateful tactical decision. Team Telefónica notched an impressive 548 nautical miles over one 24-hour period, averaging 22.8 knots. Never far behind, CAMPER with Emirates Team New Zealand posted 546nm, an average of 22.7nm. 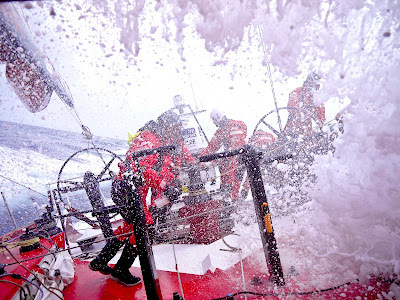 While the teams were falling short of Ericsson 4’s monohull record of 596.6nm set in the 20080-09 Volvo Ocean Race, they hit speeds as high as 28 knots -- more than 50kmh. CAMPER’s Australian navigator Will Oxley said conditions were exhilarating, with the Volvo Open 70s finally showing what they are made of with the end of a gruelling first leg in sight. When asked if the 24 hour record was at the back of the teams’ minds Oxley said no: “It’s firmly in the front of our minds.” And he reckons his team were in with a shot. As for CAMPER’s pursuit of Telefónica, time and distance could again be crucial. As the runway to Cape Town narrows to under 1,000 miles, there is less opportunity for a shake up of the leaderboard without error or accident. However, that doesn’t mean CAMPER are giving up. “We’re so focused on getting closer to Telefónica, it feels like we’re in a bit of an arm wrestle at the moment,’’ Oxley said. “The chances of catching Telefónica if we stay straight-line sailing with nothing going wrong are pretty slim. We’re putting enough pressure on them we hope by going 100 percent, so they have to go 100 percent. At the rear of the fleet Groupama sailing team again face a big decision. Volvo Ocean Race meteorologist Gonzalo Infante explained that the French team have to decide whether to take a north or south course to Cape Town. While north is more direct, it also carries the risk of failing winds in the wake of the high pressure system. The southern route could pack stronger winds that could put the boat and its guaranteed podium finish in harm’s way. Helmsman/trimmer Thomas Coville said the team were still weighing up their options. “It might end up being somewhere in the middle,’’ he said. “We have to manage the boat and we also want to save our third place. We’re still waiting for the last files to make that call. but surely it won't be very hot or very cold." Infante said winds were expected to peak later tonight, before easing to about 15 knots for the next 24 hours. Telefónica are expected to have Cape Town’s famous Table Mountain in sight on Saturday, with a possible finish late the same day or early Sunday. Meanwhile, PUMA Ocean Racing Powered by BERG are expected to arrive under motor and jury rig at the remote islands of Tristan da Cunha on Saturday. They will be picked up by a ship due to head out from South Africa to meet them. Abu Dhabi Ocean Racing and Team Sanya are anticipated to dock at Cape Town over the weekend, where their shore crews are waiting to begin repairs.